Here in Egypt when we want to refer to something that will never happen we say "fel meshmesh". This Egyptian saying in Arabic means "when the apricot season comes". Meshmesh (مشمش) is the Arabic word for Apricot. The season for apricot in Egypt is so brief that as soon as it starts it comes quickly to an end. The brevity of the apricot season in Egypt is what led to this common Egyptian saying. Apricot is a common fruit in Egypt. Many people call their cats "meshmesh" specially if their fur color is close to that of apricot. In the English language, orange is a color and is taken from the name of the fruit with the same name. In Egypt, we use the word "meshmeshi" to refer to anything that has a color similar to that of apricots. A testimony to the popularity of apricots as a fruit in Egypt. Egyptians do not only eat the apricot fruit, but traditionally we also break the seed coat of the apricot and eat the kernel inside. 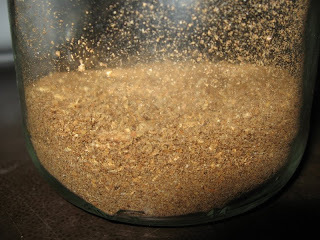 Traditionally, we take the kernel out and grind it till it's powder, or a bit course grained, then add other ingredients to it such as dried coriander and salt. We grind all this together and mix it perhaps after some roasting in a pan with no additives. The resulting mix is called dokka (دقة). It can be eaten with bread at breakfast or dinner. 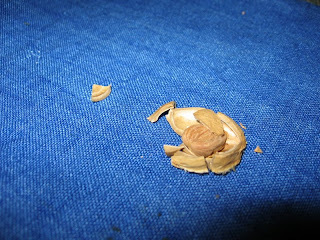 The apricot kernel can also be eaten without grinding right after breaking the protective seed coat from around it. It would taste a bit bitter yet has a pleasant taste to it at the end. It is also said to have great health benefits and has even been claimed, yet not officially proven, to have cancer preventing or even cancer curing effects. Apricot kernel can also be roasted in a pan with or without oil and then used instead of almonds either for direct consumption or in preparing foods that otherwise use almonds. well done , but wanan tell u something i have read before that Apricot Kernel is very dangerous and it may cause cancer .Really i don't know to which limit this information is true but anyway Apricot is a delicious fruit and i love Dokka ;) very much . The apricot seed does NOT cause Cancer. It cures Cancer. Take it as a rule of thumb: if it has been used for several thousands of years by Egyptians and is a traditional food, then it is not harmful. Yes apricot kernel does include amygdalin a substance which can release a percentage of cyanide which in tern has some toxicity. Yet such piece of info was actually used by pharmaceutical companies and their supporters as a back lash on the movement claiming apricot kernel could cure cancer. Again, if a practice has been there for thousands of years and is tested that long then be sure it's completely safe. The 'new' things are what we should test and retest, but what has stood the real test, which is the test of time, should not be questioned. Big drug companies malign & lie about the therapeutic properties of the kernels because they sell drugs for profit that do not cure Cancer. Apricot seeds do cure Cancer. In England, my home country, many old home made cures, potions, tonics and beliefs are called "old wives tales" and are shunned or laughed at. Increasingly more and more of these "tales" are being proved to be helpful and of true value to mankind. When British ships first came to America with crews dying from Scurvy the American Indians told them to eat the bark of certain trees that contained great power to cure Scurvy. Scurvy was cured. British returned home & told their medical people of the day of their experience. They were laughed at. Pride is a foolish mans demise. Education is lifelong. Hey mick, your comment is very interesting. I love the knowledge I got from it, the terminology "old wives tales" and how they are laughed upon. Potions sounds interesting. Here in Egypt we call them in Arabic "wasfa baladi" (وصفة بلدى) which means local prescription. Most Egyptians, including many of the well educated ones, respect such home made cures having been passed down through many generations. As you said, many of them are proven by science to be effective, yet some can be found to be harmful still. What a wonderful lesson in Arabic, botany and apricots! It's been years since my apricot tree flowered here in Southern California. I had to do some major surgery on the poor tree after an older tree fell over on top of it. I do remember though, how all the fruit would ripen at once and you had exactly one day to enjoy, preserve or give it away before it went all soft and squishy. Hey Weeping, it's interesting for me to know that all the fruits of your apricot tree in Southern California would ripen at once and gave you only one day to handle before it went all soft. Perhaps this explains whey Egyptians use it in their popular saying, since it has an extremely short season. Thanks for a really interesting recipe. I love the word "meshmeshi" for anything apricot-colored. About the home or folk remedies, over the course of 30 years' study, it's been really interesting to me to see how science keeps rediscovering the value of them. Of course some of them can be dangerous--I wouldn't drink foxglove tea unless it was an emergency. On the other hand, during the Napoleonic wars, British soldiers saw Italian grandmothers using mold from bread on wounds, and thought it was horrible. A hundred years later, turns out it was penicillin. Hey Pomona, the story about penicillin is very interesting. I never knew before about bread mold and how Italian grandmothers used to use it over wounds. Sounds pretty interesting. 30 years of study sounds like an interestingly long enough duration to observe such wonders. I guess all that boils down to one thing: there are several paths to knowledge. Each one of those paths can lead you to the same truths. Since is one path, and a very good path indeed, but sure it is not the only path, sometimes even it is not the fastest or best. Yet usually science is the more universal path that can be easily accepted by people and usually the more reliable source, universally speaking. I guess what we should do is use the power of science, yet keep our eyes open and not give science more than it deserves or think that it is an answer-all thing, for it has its weaknesses too. Hi Ashraf! I'll get down to adding the urls soon. By the way, I've always loved apricot kernel but I never about them being used as substitutes for almonds. That was interesting. Great start! Wish you the very best! Hey Terra, I wish you have included a link to your blog if you have one. I'm glad to know you always loved apricot kernel. I would love to read more about your plant related experiences, in a blog of yours perhaps. Hi Ashraf, I've tagged you on my blog. Perhaps you would like to tag some people. Hey terra, thanks for tagging me! By the way, the main thing about tagging is to include links pointing to those whom you have tagged. I have noticed you included no links at all, but just regular text that does not link to any blog using its address (URL). Even in this comment of yours, there is no link back to your blog. You should sign in first before posting a comment so that your comment links back to your Blogger profile. Thanks again for tagging. I hope you return back to your post and convert the plain text into active links pointing to those whom you have tagged. I found this fascinating, and look forward to trying the recipe. I wonder if it's only safe with organic apricots; many plants tend to concentrate pesticides in their seeds. Hmm. Do you know anything about this? I hope you post again soon; I'm looking forward to reading your stuff! Your thoughts about the safety of the seed in case of apricot not grown organically are interesting and did not cross my mind before. I guess it is worth investigation. Traditionally of course people in Egypt grew everything in an organic way, specially before building the Aswan High Dam in Upper Egypt which resulted in blocking the nourishing silt coming down from the River Nile leading the farmers starting to use chemical fertilizers. Perhaps in a changing world, one should reexamine tradition to see if it still holds true in today's context. I've learned that many people are using the raw apricot kernel or seed as a spice or food. I've consumed apricot seeds myself and found them to be bitter tasting but good. 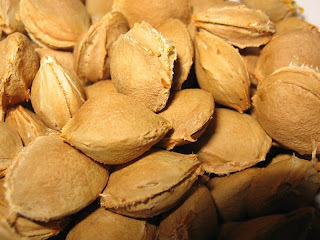 The company Nu-Gen Nutrition at http://www.nu-gen.com or http://www.cancerchoices.com sells apricot kernels. Thank you for this. I love apricots too and the season is very short. Our small tree had only about 30 fruits on it this year, after a lot got blown off by the wind last month, but they all taste delicious. Such an intense flavour you get when you pick them off the tree. I must try using the kernels too now that I've read your post. I'm so pleased to find your blog through Kate's in Australia and I'll follow it now. Chaiselongue, it's so nice for me to win you as a new reader. It's also nice to have my first comment from France. Sure picking the apricots from the treed yourself and eating them has a special 'taste' to it. The fruit would taste so delicious when you are growing it yourself, specially if you are growing it organically. I wish you enjoy trying to make and taste the kernels of your next apricot tree harvest, hopefully the wind will be more merciful next year and you would have a lot more than 30 of them. France is popular with its distinctive cuisine, I guess by trying the apricot kernels yourself you can give us some interesting comments. Very interesting! I wonder if you could do the same with peaches, plums etc. It's nice to know that you "like plants" Eric. Apricots are the popular fruit among those three (apricots, peaches and plums) in Egypt. Peaches are known in Egypt but not as well as apricots. Also with plums, in Egypt we do have the regular purple plum but more commonly (or more traditionally) we have the yellow plum, which tends to be a bit larger in size and having a thinner outer skin than it's purple counterpart and tends to feel more 'Egyptian'. I have never heard before about someone eating the kernels of apricot or plum seeds. It's not found in Egypt at least. And I will not dare try it, as you never know if something could be dangerous on the long term even. So, when it comes to 'strange' things, I tend to rely on either scientific findings or long standing traditions that have stood the test of time over several hundred (or at times several thousands of) years which is a case that can be found in Egypt and other cultures that have similarly ancient roots. I am very impressed with the information you are supplying here with this blog. I never thought of eating the apricot kernal before until now. This is so interesting! I love how you described where the name for the color orange comes from in Egypt. Please do continue writing more posts! 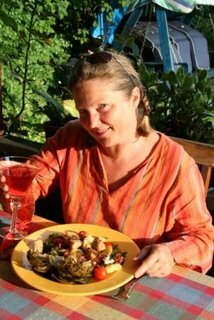 Cynthia, I love language and am interested in exploring and trying to discover interesting things about language and words. Apricot kernels are fun to extract, they look nice too if you were able to crack the nut open without breaking the kernel inside it. 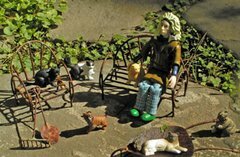 Hi What a great blog I cam here via Kate at Hills & Plains Seed Savers too. Just to add to discussion in France apricot kernels are often added (a few per jar)when making apricot jam, it deepens the flavour and is delicious. I also use them when I make Apricot Liqueur. I love the strong almond flavour of them. I have a wild apricot tree growing here and the fruit and kernels are delicious not bitter at all. I've read that you should never plant apricots near almonds or vice versa as they botanically similar and can cross fertilise and can make the almonds bitter. I never really thought about people eatting watermelon in Eygpt. I love to freeze watermelon in the freezer. Now thats cool.. Very interesting indeed, got to try it! Although this is an old post, I wish to add something. Internet users, please have a hint of source criticism. Do not believe everything you read. Yes it is true that apricot kernel has vitamin B17 and it is said to have anti-cancer affect. BUT, remember ALSO that it contains syanide and that people have DIED when eating too much maybe not much but there is this possibility and how many of you think syanide as something you want to consume anyway?). It is the same with plum and cherry kernels as well as apple seeds AND leaves. Also flaxseed contains syanide and there is recommended limit how much you can eat it per day. Constant daily use is NOT recommended. And pregnant women: please do not consume any of the above mentioned!!!!! And do not give these to children. Old wives tales/traditional customs are not always safe. Someone living in Egypt should know that ;) For instance, FGM is not safe yet it is a cultural tradition. Apricot kernels are actually used in food production but the process they use it destroys most of the syanide in the kernels. people NEVER died from eating kernel. but they DIED from CHEMO. Signed be an EX cancer patient thanks to the kernels. Please do some research on the nature of biochemistry. cyanide only kills you when it is in its raw form meaning not joined together with another substance. chloride is used to wash the toilet on its own nut safe to consume in salt. Thank you for the informative info Johki. I strongly advise everyone reading this post to take what Johki has mentioned about apricot kernels into consideration. Indeed, I have further researched the topic and found that the human small intestines beta-glucosidase which catalyzes the release of the cyanide from the amygdalin present in apricot kernels. Each apricot kernel contains around 0.5 mg of cyanide. I'm just wondering why I'm not dead by now although I've been eating from 8 to 10 apricot kernels a day during last year's apricot seasons in Egypt! Science is cool, yet to me what I try by myself is what I believe in more. What has stood the test of time and we have seen its results on a long time scale to me is ever more valid. Once again, I would advise you to take Johki has mentioned into consideration. For even if the organically grown apricot kernels were safe, the ones that are grown using chemicals (as fertilizers and/or pesticides) might not be safe as such chemicals usually are concentrated in the kernel and the testing of chemical residues is done on the fruit (which is the commonly consumed part by consumers) and not the kernel. Again I would like to thank Johki for her valuable input and sincere advice. I rectify my writing a little bit. There indeed is such a thing as apricot kernel that tastes sweet. This sweet kernel is not dangerous. Bitter one is. Have you been eating sweet apricot kernels? Because if you have, do you know where to get them in Cairo (or fresh apricots that have sweet kernel inside)? I love apricots and buy them every time I go shopping but all the kernels I have tasted, they are bitter so I don't eat them. I don't think one dies if one eats apricot kernels in moderate amounts but if you want to play safe, don't eat bitter ones too much. I don't even have a clue if people die for this in Egypt but then again would it never come out as most Muslims are buried within 24 hours = no time to find the cause of death (unless there's been a crime). I've not yet tried the sweet type. Thanks for telling me about it, I did not know it existed. Perhaps some time I'll find it. Some boil the bitter type to lose its bitterness however. Please research the lethal dose of cyanide. That is very interesting about the cats being called that. My brother (who is not Arab) could not think of a name for his cat and ended up just calling him Meesh-Meesh. One day when my son's dad (who IS Arab) was there, he looked very surprised about the cat's name and commented that it meant "apricot"..I did not know that cats are called that, too! So very interesting to know this interesting story! I love it! I am the cat mesh-mesh who has a long tail. I sing and get cheerful making millions of people happy. where can i buy apricot kernels in egypt?? In Egypt, you cannot buy apricot kernels but you can by apricots. Apricots in Egypt, like most other fruits, are sold only during their season. The apricot seasons is extremely short and is around May and June. Bottom line: the only way to 'buy' apricot kernels in Egypt is to buy a quantity of apricots during its season. I have been researching this and am finding that if the apricot pits are roasted, the cyanide is eliminated. I found one place where they said to roast at 350 degrees for about 10 minutes, but that was in a recipe on a blog. I am not sure if it is the right amount or not. The Welcome Deposit Bonus is an optional one time only offer made available to all new members on their first successful deposit. anyone know to break the protective seed coat of apricot without using brute force? to pull back on the handle a bit so the impulse of the head doesn't crush the shell, i.e., tap down and draw back. 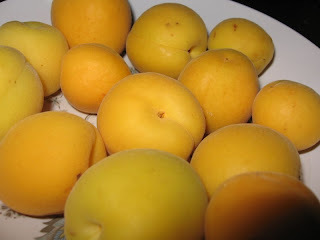 There are a great many cultivars of apricots being grown and each of these varieties produce different quantities of amygdalin, from sweet, like almonds, all the way up to extremely bitter – comparable to bitter almonds, which were once readily available. One should be aware of the bitterness of their chosen kernel. Many of the “bitter” kernels being sold are really not very bitter at all. They contain very little amygdalin, and certainly not in therapeutic values. The bitter the better, as they say. Consumption should be varied accordingly. Trial and error through slow and steady consumption is the only real way to determine suitable dosages. How can I buy the kernels from you. I used to have cancer and thx to apricot kernels am healthy again, but someone I know needs them as he is sick. open them carefully, and try eating a couple of them daily.